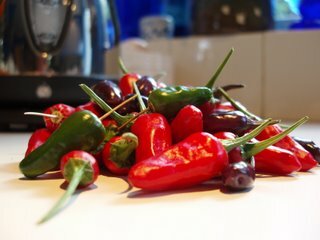 I've been harvesting this year's chilli crop and there's a mini-Festival of Chillies going on in the kitchen. The purple ones which look like baby aubergines are really evil. If they were bagged in a supermarket they would need at least five chillies to symbolise how hot they are and as far as I know the scale only goes up to three. I haven't actually tried them myself but I tested them on a friend last night... he's still alive I think and his cold has gone, but I doubt he will be able to actually taste anything until 2007.